CRAFT Tech performed design optimization of a 3D wind turbine blade using our in-house optimization framework, consisting of CRUNCH CFD coupled with an acoustic analysis module. This project’s objective was to reduce noise without adversely affecting wind turbine performance. The baseline shape of the wind turbine was the BSDS (Blade Systems Design Study) developed at Sandia National Laboratories. Our optimization process yielded a design map of aerodynamic power vs. radiated sound, which was used to identify important and interesting designs. 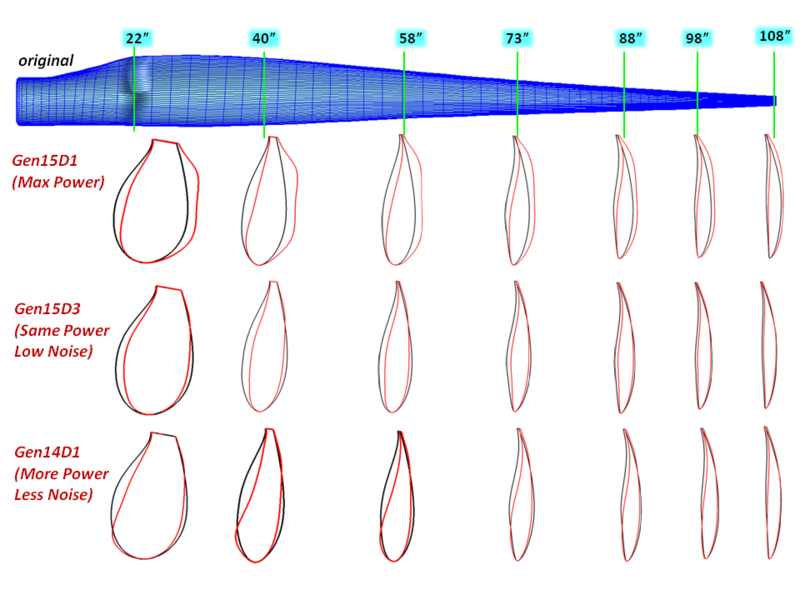 Airfoil cross-section shapes for different designs extracted from design space. Cross-section of BSDS shape is shown in black. Other designs are shown in red. While there are many sources of noise in wind turbines such as tonal noise due to the rotation of the blades, blade turbulence interaction, and vortex shedding from the trailing edge of the blade, the main emphasis in this study was on tonal noise reduction. However, tonal noise is directly dependent on blade loading. Therefore, it is more appropriate to carry the design optimization exercise by improving the aerodynamic performance and reducing the noise simultaneously. Both objectives are in a sense, conflicting, since in most cases increasing the blade loading leads to increased noise and vice versa. The objective function used for our design optimization study was defined as the ratio of the aerodynamic power to the rms of pressure (peak levels) or in other words the aerodynamic power per unit of sound pressure level. This definition would facilitate improved designs for blade loading that generated less noise. The optimization process was carried out utilizing our design optimization framework that included our Genetic Algorithm based optimizer, the SCULPTOR tool, which was used to deform the geometry and computational grid, and a CRUNCH Multi-Physics CFD coupled with a FfowcsWilliams-Hawkings based noise prediction procedure. The CFD simulations were performed to get an estimate of the aerodynamic power, and the steady state blade loading were passed to the acoustic solver to estimate the tonal noise levels from the steady blade loading. Design landscape showing power generated by each design and noise characteristics. The design landscape also shows a subset of designs (Preto-Front) where designs having the non-dominated solutions exist. The designs that lie along the Pareto-Front represent designs that are non-dominated i.e. those designs that are not dominated by both sound pressure levels and aerodynamic power by the rest of the designs in the design landscape. There are three designs that represent interesting features in the design space (G15D1, G15D3 and G14D1). 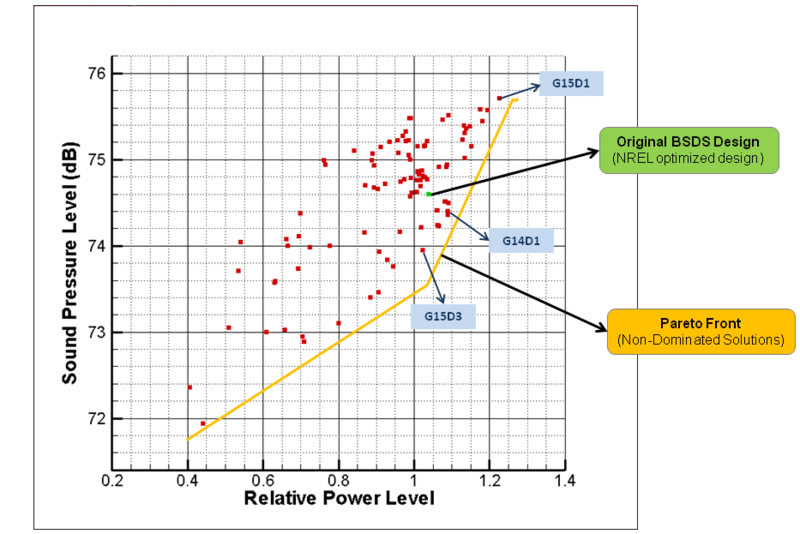 G15D1 represents a design that generates the maximum amount of power. Consequently, it also has significantly higher tonal noise. However, it is noteworthy because tweaking the BSDS design can lead to approximately 20% more aerodynamic power which is extremely attractive for designers of wind turbines. G14D1 represents a design that generates roughly 5% more power than the BSDS blade but also generates less tonal noise. Design G15D3, on the other hand generates roughly the same amount of power as the BSDS design but about 0.6dB less noise than the BSDS blade. In locations where noise is a greater concern for the operation of wind turbines, the designs to the left of G15D3 along the Pareto-Front generate less noise at the cost of aerodynamic power. For example there is a design that generates only 72 dB noise, which is over 2.5 dB lower than the BSDS design. However, this comes at a huge cost of the aerodynamic power levels. *Front page slide image by Kim Hansen (CC).